The Lanham center point is about 1 mile northeast of New Carrollton Amtrak and 3 miles east of College Park Aviation Museum. Courtyard New Carrollton Landover : 8330 Corporate Dr. It's always a great time to visit Lanham, as you'll find plenty of events and activities all year round. If you want to plan around optimal weather, note that spring and fall are the most pleasant times of year, thanks to the moderate temperatures. Summers tend to get hot and sticky, with high temperatures near 90 degrees and frequent thunderstorms. In contrast, winters can get chilly, with lows in the mid-20s and about a foot of snow throughout the entire season. 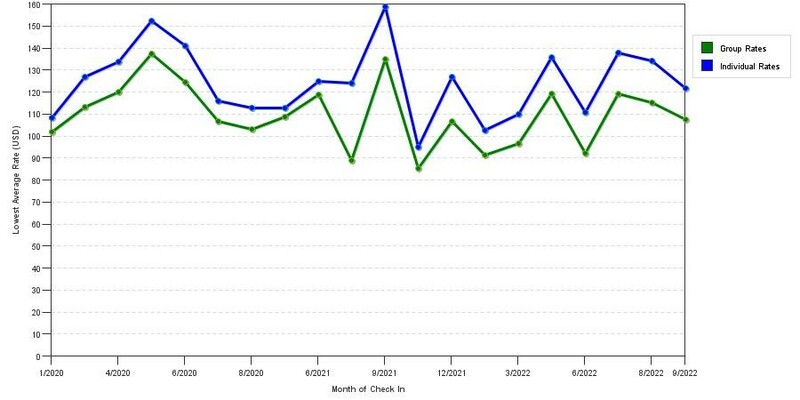 You'll typically find the lowest hotel rates in the winter, and most hotels also offer discounts in July or August. Due to the great weather and numerous events in the spring and fall, these tend to be the priciest times of year to visit Lanham. Seek out group discounts or special advance booking deals to make your trip budget-friendly even during high season. 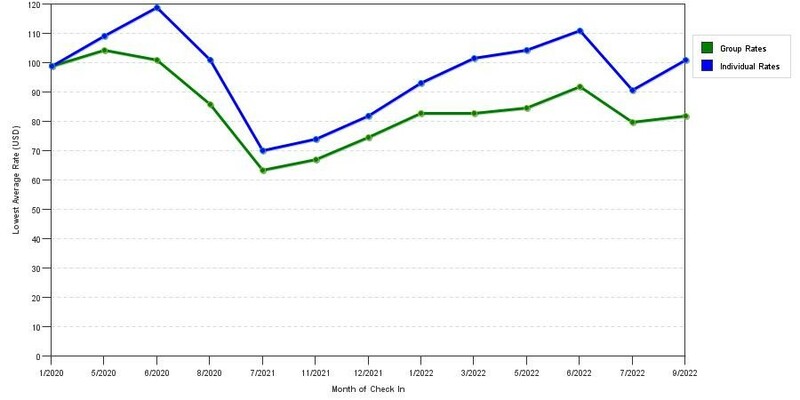 Below we've posted 3 graphs displaying average rate patterns by star rating class in Lanham, MD. 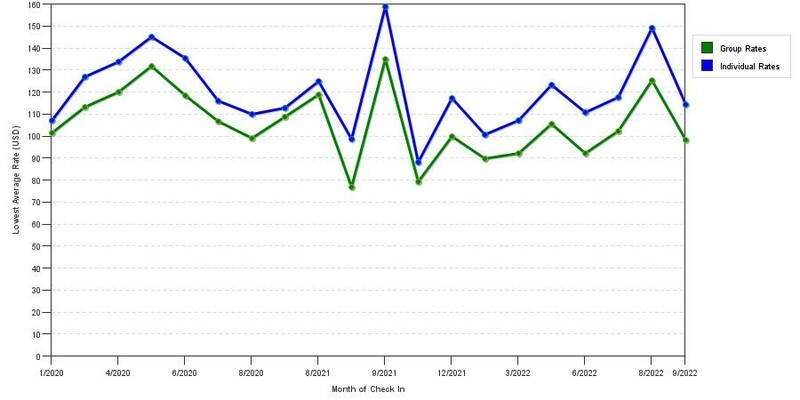 Analyze these line graphs to determine the cheapest dates to make a reservation in Lanham for upcoming travels. Book the luxury stay you deserve at Lanham's best hotels. Check out the area's top high-end accommodations. Situated in nearby Landover, the Courtyard New Carrollton Landover has the ideal room for your stay, from standard guest rooms to one-bedroom suites. Watch the latest movies in your room, relax in the indoor pool and hot tub, or work up a sweat in the fitness center. You can also sit down to a meal in the Courtyard Café or explore one of the many local restaurants. Business travelers will appreciate the hotel's complimentary Wi-Fi, business center, and free shuttle to the local Amtrak and Washington, D.C. metro stations. It's easy to feel right at home when you stay at the Residence Inn Capital Beltway Largo. This all-suites hotel is ideal for extended stays, as the rooms are spacious and range from studios to one- or two-bedroom suites. All rooms come with fully equipped kitchens so you can prepare your favorite meals throughout your stay, and you'll also want to take advantage of the hotel's complimentary breakfast each morning and social hour each evening. Have a family get together in the hotel's inviting outdoor space or plan an event in the 1,200-square-foot event space. When you stay at the Greenbelt Marriott, you'll be minutes from Interstate 495, which offers easy access to Lanham and the rest of the Washington, D.C. metro area. Relax in your comfortable room, have a great meal at the hotel restaurant, or grab a cup of coffee at the on-site Starbucks. If you want to get out and explore the area, take advantage of the hotel's concierge service or hop on the hotel shuttle, which serves locations within a 3-mile radius. Want to save your vacation budget for experiences instead of accommodations? Book one of the Lanham area's best budget-friendly hotels. Located in the heart of Lanham, the Red Roof Inn Washington DC Lanham offers affordable accommodations with all the essentials. Rooms include comfortable double or king beds, along with free wireless internet access and flat-screen TVs. With over 100 rooms, this budget-friendly property has plenty of space for your whole group. When you're ready to get out and explore the area, you'll find Six Flags, Fed Ex Field, and the University of Maryland just a short drive away. Whether you choose a standard room or a suite at the Days Inn Lanham Washington DC, you'll appreciate the hotel's affordable room rates and welcoming staff. Rooms include essential amenities like microwaves, mini fridges, coffee makers, and flat-screen TVs. You can also take advantage of the hotel's free Wi-Fi, fitness center, and easy access to nearby restaurants and local attractions. The Days Inn is a smart choice for guests planning an event on a budget, as the hotel has a banquet area that can accommodate up to 150 people. In nearby Greenbelt, the Holiday Inn DC Greenbelt has over 200 affordably priced rooms with all of the essential amenities. Guest rooms feature conveniences like coffee makers, TVs with on-demand movies, mini fridges, and microwaves. When you stay here, you can also kick back in the hotel's lounge, which has pool tables and games, or have a bite to eat at the restaurant. Use the free Wi-Fi throughout the hotel to stay in touch with friends and family and keep everyone updated on your trip to Lanham. No matter what type of stay you're planning in Landover, you can score great deals and group discounts. For instance, AARP members and senior travelers can get low rates at the Courtyard New Carrollton Landover and at the Residence Inn Capital Beltway Largo. AAA members can save at the Holiday Inn DC Greenbelt and at the Best Western Capital Beltway. Government employees can get discounts at the Days Inn Lanham Washington DC and at the Red Roof Inn Washington DC Lanham. Get the best value for your money at Lanham's top-rated mid-range hotels. Take a look at the area's best value options. Stay at the Best Western Capital Beltway, and you'll be right in the heart of Lanham. This mid-range hotel has everything you need for a great stay in the Capital Region. You'll appreciate the in-room amenities, which include free Wi-Fi and luxurious bedding. You'll also love the complimentary breakfast each morning, which includes pancakes, fresh fruit, coffee, and much more. Business travelers will appreciate the hotel's meeting services, business center, and convenient location in the Washington, D.C. metro area. Book your stay at the Holiday Inn Express, and you'll be conveniently located in Landover Hills, just minutes from Lanham and countless local attractions. You'll appreciate amenities like free wireless internet access throughout the hotel, along with free parking and a complimentary Express Start Breakfast Bar. After all, fresh coffee, cinnamon rolls, eggs, and bacon are the perfect way to get your day started. This group-friendly hotel offers an average group discount of 22 percent, and guests traveling on business will also appreciate the hotel's business center and complimentary local shuttle. At the Staybridge Suites Washington DC Lanham / Greenbelt, you can kick back and relax in a spacious suite without overspending your vacation budget. You'll appreciate the large guest rooms, which come with kitchenettes, separate spaces for sleeping and relaxing, and free wireless internet access. You'll love the free breakfast each morning, along with the complimentary social hour on Tuesday, Wednesday, and Thursday evenings. You can also kick back and relax in the hotel's welcoming outdoor space, stock up on essentials in the on-site convenience store, and stay in shape in the hotel's well-equipped fitness center. Just minutes from the center of Lanham, you'll find countless attractions that will appeal to everyone in your group. In town for the big game? Get tickets at Fed Ex Field, the Washington Redskins' home stadium and the host of numerous other events throughout the year. Want to get out and explore the great outdoors? Greenbelt Park is just a few minutes west of Lanham and features four trails of varying lengths and difficulty levels. Pack a picnic lunch, spot birds and wildlife, or enjoy the stunning fall colors during an autumn hike. This large green space, which is part of the National Park Service, also has over 150 available campsites. Golfers at all levels will want to book a tee time at the Glenn Dale Golf Club, a historic 18-hole course that features a range of challenges and beautiful views. After a round of golf, unwind at the 19th Hole Lounge, which serves drinks and snacks in indoor and outdoor seating areas. The Lanham area is a popular destination for space enthusiasts, and visitors of all ages can plan trips to a range of intergalactic attractions. Plan an afternoon at the NASA Goddard Visitor Center, where you can view exhibits that explore astrophysics, planetary science, communications, and much more. Check the visitor center's event calendar before you go to make sure you don't miss a thing at the Goddard Space Flight Center. If you're traveling with kids, you'll also want to visit the Howard B. Owens Science Center. This large facility has a planetarium and hosts a full calendar of family and kid-friendly events. Immerse yourself in local culture at Prince George's Little Theatre, which produces a range of dramas, comedies, and classic plays throughout the year. Be sure to purchase your tickets in advance, and note that the theater offers discounts for students and seniors. Ready to start planning your Lanham trip? Book the ideal hotel for your group and start building a fun-filled itinerary.